Vapefly Mesh Plus RDA utilizes a postless dual clamp deck, supporting mesh wire, standard single coil and dual coil builds. 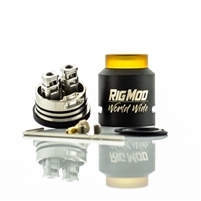 25mm diameter base with large e-liquid and cotton well for ample wicking and saturation. Vapefly Mesh Plus RDA includes a bottom feed squonk pin for squonking. Overall, this is a great RDA for flavor connoisseurs, trickers and cloud chasers.